Troy Cassar Daley surprised his wife 4KQ’s Laurel Edwards with a Countdown Party to celebrate her 50th Birthday. Special guests included WSFM’s Jonesy and Abi Benaud (Kyle and Jackie O producer who worked with Laurel at 4KQ), 97.3’s Bob Gallagher, her 4KQ Breaky teammates Mark Hine and Gary Clare CD Barry Drinkwater, but the guest that completely blew her away was the man she has stalked and idolised since she was 7, Daryl Braithwaite. See the video. 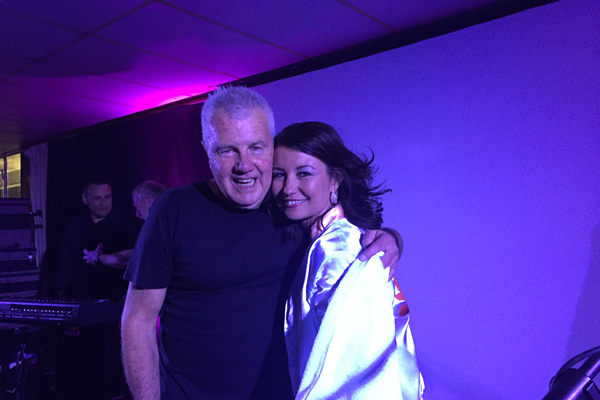 “I’m still floating on a cloud thanks to my amazing husband who surprised me with not only the perfect ‘Countdown’ party but a performance by the man I have stalked and idolised since I was 7, Daryl Braithwaite!”, said Laurel. “As a young girl I would sit in my satin Sherbet jacket Mum made me and stare at their album cover while playing the turntable. I would fantasise Daryl would walk up the front stairs and knock on the door.